(CNN)A police officer who swapped places with a female hostage during an attack by an ISIS supporter on a supermarket in southern France has died of his wounds, French authorities said. 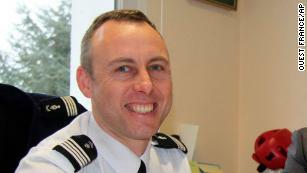 Lt. Col. Arnaud Beltrame, 45, was shot in the neck Friday after offering to take the place of a woman during a gunman's assault on the Super U supermarket in Trèbes. Police found two unexploded homemade bombs, a 7.65 mm pistol and a hunting knife when they searched the market after the attack, a French judicial source told CNN. The attacker, Radouane Lakdim, 26, a Moroccan-born French national, was a petty criminal already on the radar of French police for his links to radical Salafist networks, authorities said.